1. 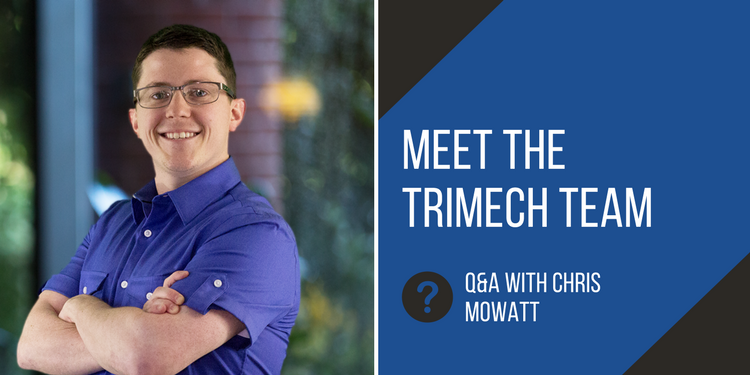 Describe your role at TriMech and your professional background..
As an application engineer at TriMech, I spend most of my time meeting directly with our clients, helping them leverage the plethora of SOLIDWORKS solutions to streamline their processes and save them time and money. My background is as a mechanical engineer with industry experience in robotics and downstream automation for the plastic injection molding industry. 2. What area of work are you most passionate about and why? My greatest passion at TriMech is assisting our clients with their product communications needs. 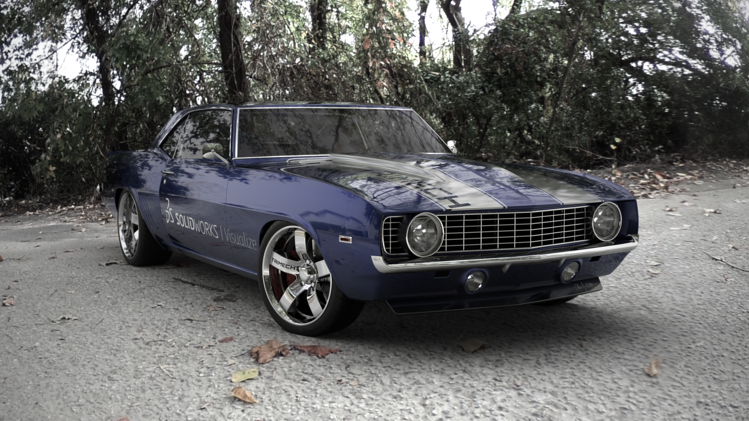 SOLIDWORKS Visualize, included with all SOLIDWORKS Pro and Premium subscriptions, possesses all the tools needed to produce product/assembly manuals, photo-realistic renderings and full-fledged motion animations. I see many of our clients hiring outside contractors to produce that content when they already have the tools in-house to do it themselves. When clients can quickly and easily produce marketing content themselves, it saves them time and money. 3. What is your favorite thing about SOLIDWORKS Visualize? My favorite thing about Visualize is how easy and fast it is to produce professional looking images and animations. 4. What are little-known benefits, tricks, etc. that you can share with us? Visualize is exceptional in rendering transparent appearances compared to other products on the market. By using the Caustics option, Visualize is even capable of producing the “rainbow” effect seen when light passes through a prism. 5. Can you explain what competitive advantages Visualize offers to client’s workflows? Unlike other rendering solutions, Visualize is tightly integrated with SOLIDWORKS CAD and can update the model when the design changes in SOLIDWORKS, eliminating the rework that would otherwise be required with third-party programs. With Visualize Professional, you also have the advantage of importing SOLIDWORKS motion studies to create fully rendered animations. This makes it infinitely easier to produce the complex motion of mated assemblies and gravity studies in Visualize. 6. What is your favorite accomplishment with SOLIDWORKS Visualize? My favorite accomplishment with Visualize was assisting one of our clients in using Visualize Standard to replace a third-party rendering product that they were using and paying a separate subscription for. The client’s products were transparent water bottles of all shapes, colors and sizes. After spending only 10 minutes showing examples of how to render those objects in Visualize Standard, the client was completely satisfied with Visualize’s capabilities and no longer needs to pay a subscription for the third-party product. 7. How does Visualize impact your work, the industry, other 3DP / 3D CAD technology, etc.? Whether we are the producers or consumers of the product, Visualize allows us to see a realistic representation of the final product before it has even been manufactured. You can push the realism of your renderings to the extreme by creating your own HDR environments to place your products in a scene where they will actually exist. 8. Where do you anticipate it going from here? I anticipate that Visualize will continue to become more tightly integrated with SOLIDWORKS CAD as well as give us the ability to view renderings with a virtual reality headset. At SOLIDWORKS World 2017, I had the opportunity to wear a VR headset that put me directly inside of a rendering, and I was amazed by its quality. With the combination of creating your own Visualize environment and being able to “look around” that environment using a VR headset, I can’t think of any better way to bring a product to life without having it physically in front of you. 9. Why should someone attend your webinar at the end of May? This webinar is for anyone interested in using Visualize to create renderings of their products and want to represent them in an environment that they would truly exist in real life. Attendees will learn what tools they need to create their own 360 degree, HDR environments, and how to position your 3D model in them for the most realistic results. 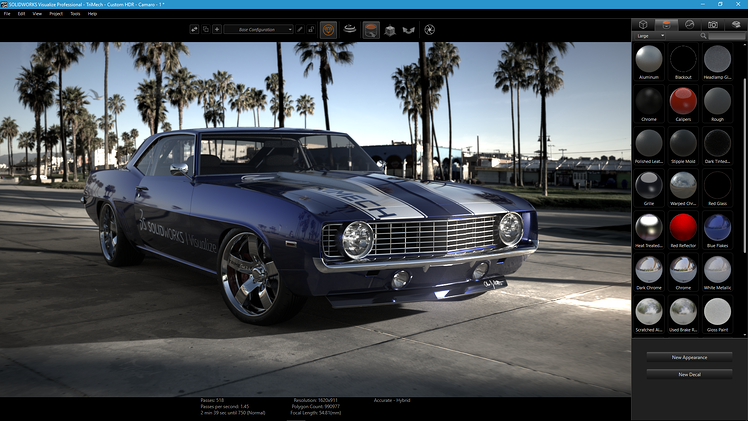 For more insight from Chris, register for his upcoming webinar, How To Create Custom HDR Environments in Visualize, on Wednesday, May 24th.